38. The Wide Open Hook! As Alan looked at the wide-openness of this place, and felt the warmth, and breathed the air, he felt something in his soul was waking up. This place was limitless! He began to notice things like how the sky varies in color, and the way the long shallow waves wrap around the sand bars; their shimmery patterns bright in the sunlight. He also saw how the sand has been shaped by the waves and the tidal currents, and how the incoming tide was right now changing things. The place seemed to say, "Be who you are!" 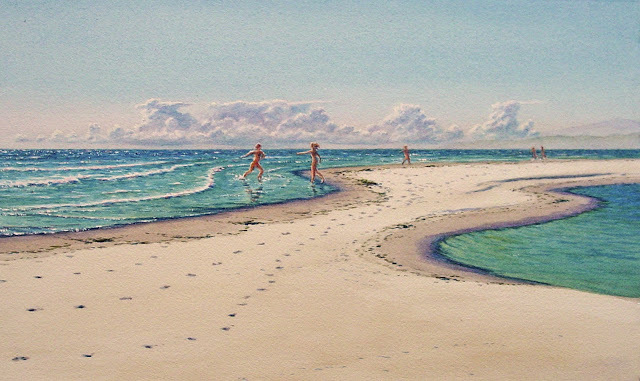 Out on the flats, the tiny figures he saw at first were about ten or so young people, fit and tan and with no clothes on at all! They were running, chasing and splashing each other or tossing frisbees. They were clearly delighted by the salt water, the breezy warmth, the sun, and the energy they were sharing. Their occasional yelps were the only sound above constant soft roar of the distant surf. He took a few deep breaths, and then proceeded to make picture Number 2, The Hook. It took longer than he thought, and the second try seemed to satisfy him. The people were the hardest. And then he walked out onto the vast sand bars. As Alan walked along, some of the kids waved to him, and he sheepishly waved back. The afternoon was warming up, and Alan, sweating in his hiking outfit, suddenly felt that he wanted to run into the ocean too (just to cool off!). So then he muttered, Oh, crap, why not, stripped everything off and splashed into the waves. Then he ran, kicking water up to his armpits, and suddenly realized why these kids were doing this - it felt incredibly good! The sensuality of the sun and the water were part of it, but the idea of having absolutely nothing attached to him, not even a ring on his finger, was somehow extremely liberating! Some of the guys and girls ran past him and around him, splashing water everywhere - and he picked up the game, dodging and splashing among them. Totally winded, he finally had to slow down, and he raised his hand at them to wave a Thank You! This inspired Alan to camp on the higher dune where he had been sitting, and that is where he pitched his tiny mountain tent. It is a brisk half-day hike from Biloxi to The Hook. The Sand Dune Inn served a complimentary breakfast, so Alan went down early, and found the place already quite busy. The two girls from the spa last night waved him over to join them, and this time he wasn't hesitant. "Hi," He said, and then took a chair. "I gather you are both traveling ...?" "Oh, Yes", the one named Andrea replied. "We're on our Long Walk...You know, where we carry everything with us, walk places, camp out, stay at tribe settlements for a while..."
"We've been out about six months now," the other girl, Hannah, added. "We're off to Hooksands Preserve to swim and do nothing for a few days, then to the Shores Tribe where we'll be staying for a while. They raise shellfish on Sandy Bay and we heard they're really cool." "Wow," Alan said, "Six months is a long time! I'm on a walk myself, but only for a couple of weeks, I think." "Oh, we're just starting out! We hope to stay on the paths for two years - if we can get on together that long," and they gave each other a look that could have meant anything. "So what'll you do at this Shores Tribe?" Alan asked. "Uh, dunno yet. Work in their cannery, tend the gardens, babysit," Harriet shrugged. "They make the most delicious smoked oysters...very pricey in the shops!" Andrea added. Just then a very young waiter approached the table, and both girls said to Alan, "Get the sausage omelet!" So Alan said,"Okay", and to the waiter, "Please add a bowl of oatmeal and coffee with cream." "So," Alan said after the waiter left, "you're going to wander around for two years...?" "Yeah, but with a purpose. Didn't you do it?" "Uh, no. I'm from the States and no one does that there - except a few loners or traveling hobos. 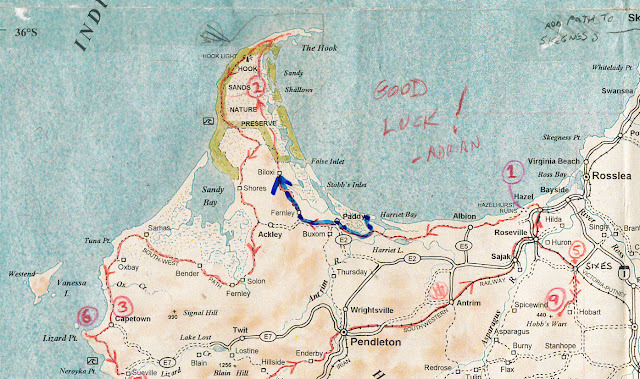 The closest thing I guess, would be a long hike in a National Park, but not like you are describing. It would be a dangerous undertaking for young people there, especially just out walking. Everyone drives!" "Huh! That is so sad, said Andrea. "I don't know how I would have gotten through public school if we didn't have The Walk to look forward to...it's all anyone talks about during our last year." Then Hannah asked, "So how do people learn about who they are or what they're meant to do in life? Okay, here's an example: When I finished public school, I knew stuff but I didn't know me yet, or what I want, or who I'm meant to be, and all that. We go on The Walk, as we call it, to find ourselves. The guv'ment even helps out by offering money to tribes like Shores, to pay us to work in their trades. Over time, we stay and work in several different tribes, or even for the guv'ment, fixing trails, planting trees, and learning stuff. And then afterwards, some of us go on to university, and others might stay on at one of the tribes." "And we meet boys, too." Andrea added with a grin. Thoughtful about all that, and fully restored (The breakfast was perfect! 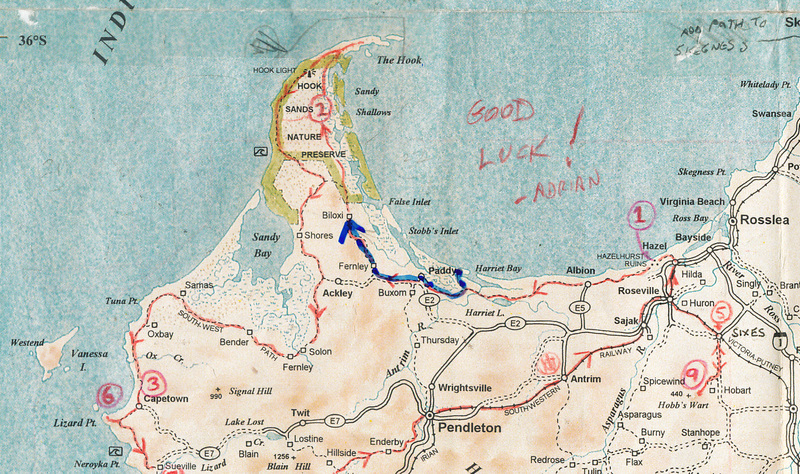 ), Alan bought a few trail meals, packed up his bag, and set off for The Hook. Once out of Biloxi, the path turned sandy and slowed his pace. For a few miles, he walked along a narrow verge where the nearly white sand dunes met the salt marshes thick with patches of mangrove-like thickets. He was inside the Hooksands Preserve now and there were no settlements. The dunes cut off any sound from the ocean but the marshes and thickets were full of birds carrying on with melodious calls, strange burps and outright screeching. It was a spare and beautiful landscape! Finally the dunes flattened out revealing miles of sand bars and shallow channels, the sharp end of the Hook! Now Alan could hear distant surf on the ocean side, and he also noticed, in the distance to his left, a lighthouse, complete with a keeper's house - the only structures anywhere around. On the sand flats ahead, he could make out some distant figures - people running and dancing among the shallow pools. It must be low tide, Alan thought. He finally stopped and sat on the last of the dunes, where he had a good view of the outer sand bars. 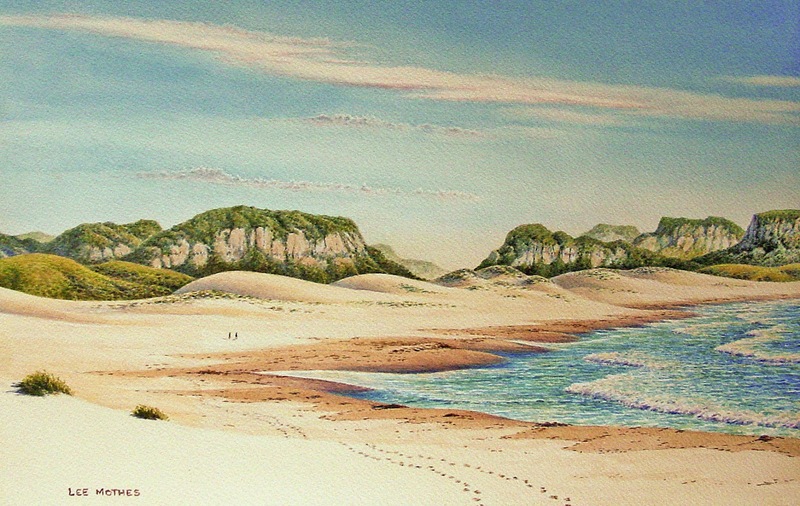 The patterns of sand and water, and a few people out there, made it an appealing place to sketch. He sat down to have some lunch and unpack his art stuff. After a long, chatty supper of what Amelia called hamburger soup, plus some grilled toast and tea, they moved into the living room with some wine. Alan learned that Amelia wrote stories and a weekly column for the Putney Times, and that she is also a dedicated surfer. "My readers love a little gossip, especially what I overhear in the coffee shops and what my spies send me on NetMate. My job is to find out what is really going on, and then, discreetly, blab about it in the Times." "So I gather that NetMate is your social network here?" "Yes, and I love it! I don't have to travel nearly as much now to gather the goods! It's quite a new thing, since not many of us have computers, and those smartphones that everyone else in the world have are only a dream here." And when he inquired about the surfboards outside, she lit up. "Oh, surfing is my passion! I live for that ocean energy, that power under me when I ride a wave. We have a surf club called The Westend Surfing Assn., named after this point called Westend on Vanessa Island. We sail out of Paddy and around the Hook on an old gaff-rigged boat and put in on Vanessa's lee side. then we hike over the island and set up camp on the ocean side. There is usually a beautiful mile-long left there." And then Amelia's eyes really lit up when she added, "And sometimes it gets BIG! I can't wait until we go on another trip." The sun was shining the next morning. She made him coffee and a hearty breakfast, and by mid-morning he was finally on his way to The Hook. As he walked, he felt all warm inside - happy that he could make a friend and be a friend as easily as he has done here. First Carla on the boat, then Adrian, now Amelia, and yes, even Jeremy. Are the people different here, is it just him, or a little of both? By evening he reached Biloxi, and found a place to stay called The Sand Dune Inn and Spa. Biloxi was a settlement of perhaps 50 small stucco-coated houses huddled among some grass-covered dunes. Bushy wind-blown trees and patches of flowering groundcovers added color among the houses. There were no stores, but the Inn boasted a "deli" that offered groceries and basic necessities, including the services of a tiny post office. At the check-in desk, an elderly woman, dark and sun-wrinkled, took Alan's money (cost: one roger) and without saying a word, showed him to a tiny room with a narrow bed, then the toilets, and then the "spa", a large, steaming, beautifully-tiled communal pool set in the ground. A roof covered half of it, the rest was under the open sky. The bath was unoccupied, so he tested the water and realized he could use a good soak. He returned after dark with his towel and found another fellow in the pool, who said, "Welcome, welcome, plenty of room." In the dim light of the single oil lantern, Alan noticed the guy was naked. Hm, shall I keep my swimsuit on or not? He decided to leave it on and settled into the water. His fellow bather said nothing at all, and that was just fine. And then two girls, teenagers likely, walked in, wrapped in large bath towels. They removed the towels, which were their entire wardrobes, and without a word stepped into the steaming pool. Alan tried very hard not to look, especially since they both offered their names and asked his. (The other guy seemed to be meditating...) Alan nodded to them, muttered his name and a glad-to-meet-you, and then then also pretended to meditate, realizing he'll probably have to get used to this sky clad thing that Adrian mentioned! Not wanting to knock on the door, Alan shouted, "Ahoy, there!" from about a hundred feet away. This is so weird, he thought. He tried again, "Is anyone home?" Nothing for another long minute, then a female voice almost sang the words, "Who IS it, and what do you WA - ant?" "Um, I come in peace!" (ouch!) "My name is Alan and I was on my way to Paddy and I must have taken a wrong path back near that long bridge. I just thought that, if you could let me, uh, rest here, I would be most grateful." By then it was not only getting dark, but a wet wind had kicked up, accompanied by a long roll of distant thunder. Silence from the house, then "Well, come up to the porch and we can talk. " Alan marched quickly to the door, and he was met be a very tan, stocky, and muscular 40-ish woman about five feet tall wearing a baggy sweatshirt and what the surfers call board shorts. She smiled tentatively as she examined him through the screen door. Alan studied a couple of surfboards on the porch floor, and tried to think of something to say. The woman spoke first, "Well, you look innocent enough. Uh, Alan, you said?" "Oh, yes!" Alan smiled broadly. "So tell me more... You sound different. Are you American?" Alan nodded. "I thought so. And what brings you out this way, aside from being lost?" Alan couldn't blame here for being wary, so he tried to sound as normal as possible. "I'm on my way out to the place you call The Hook to paint a picture of it. Then I'm continuing to other places like Capetown to make more pictures. I sketched the Hazelhurst Ruins the other day, the first place on my list, and then I started out from Hazel just this morning. 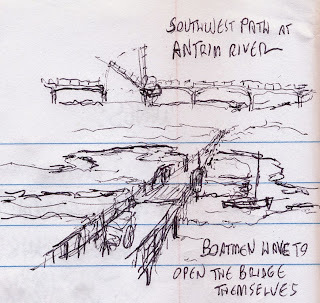 I had lunch in Albion and then stopped at that long bridge at the Antrim River to rest, and I decided to sketch it." He pulled out a small notebook. "Here's the sketch...I know it's pretty rough, but it's not on my list. It just looked interesting, the bridge, I mean, and..."
"Okay, okay. Why don't you come in and we can have tea or something. You're lucky I'm in a good mood!" Alan put away his notebook, left his pack on the porch, and walked into a warmly-lit living room paneled with old, smooth, honey-colored boards. A large brick hearth at the far end of the room contained a cast-iron wood-stove whose doors were open. "When you were yelling 'ahoy' out there I was just about to light a fire...get the damp off, yes? By the way, I'm Amelia," and she offered her hand, then gripped his firmly. She had already turned to walk into the kitchen to heat up some water. She soon returned to the wood-stove, lit the fire, closed up its doors, pointed to a chair and said, "Let's sit." Alan was looking at a large framed painting of moonlit waves an a dark beach. "Nice waves up there," he said. Amelia glanced up, "Oh yes, my friend Adrian Graham painted that. Have you seen his work? "Just recently. As a matter of fact, I live above his gallery." "Oh, so you're the chap from the States that's doing the pictures for the tourists..."
Alan was surprised at this; news gets around quickly here. She went on, "Someone you met on the train the other day told one of my friends on NetMate*, and she posted it to me." "Ah, the train ride. That would have been Jeremy - a very talkative chap I had the fortune to sit with. I didn't know my arrival would be so newsworthy!" "Oh, it's newsworthy. We don't get many foreign travelers here, especially someone with a guv'ment job. Is it true they hired you and paid your way all the way from the States to paint some pictures?" "Yes, I've agreed to 'depict,' as you say, 105 places-of-interest all around the island. And to be up-front with you, part of me is petrified that I'll never complete them all. My first day out and I'm already lost!" "Well, I wouldn't say that, Alan. 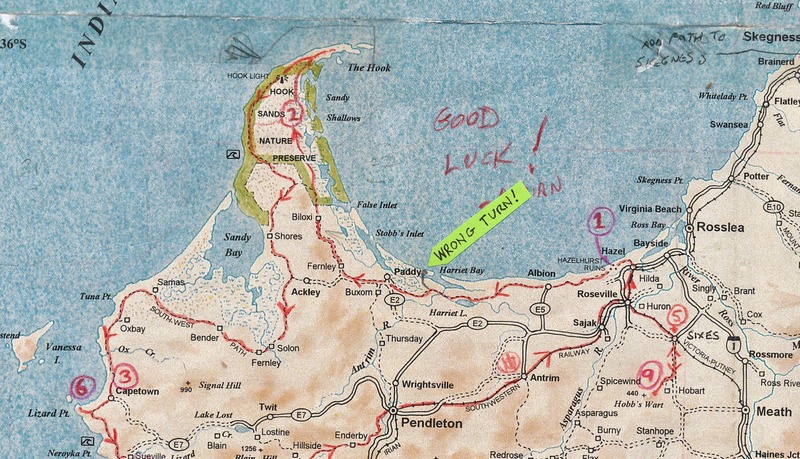 You're only a couple of miles off course. 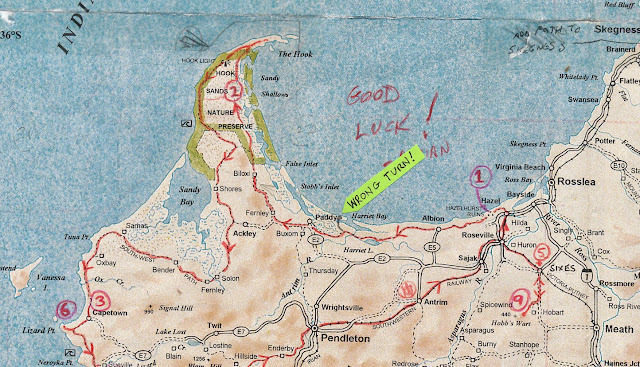 And if you're heading to The Hook, you should be there by late tomorrow, weather permitting. I heard there might be a storm in a few days, and that the surf should be up as well." 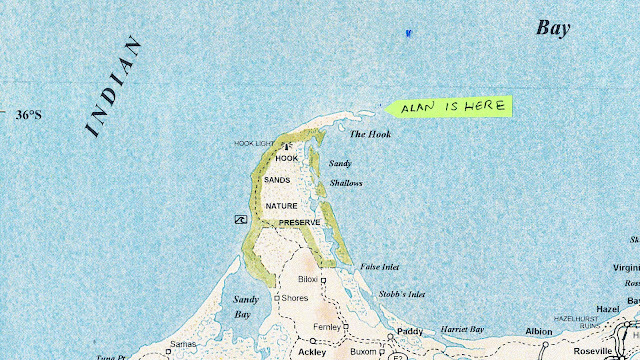 "So this isn't the storm,"Alan asked. "Oh, no, just a thundershower. We do get some good size gales, especially south of here, and they send us the best surf beforehand!" Anyway, come in the kitchen with me and have tea. We can talk more while I heat up some soup. You eat meat? Oh, and bring in your pack before it gets wet!" *NetMate is New Island's primitive version of Facebook. Alan hadn't walked three hours, and he was feeling it in his legs and feet already. He was definitely ready for a break when he stopped for lunch at the Albion Cafe. Albion was about the size of Hazel. It seemed to be more of a farm town, dominated by a sprawling sort of feed store that also sold lumber, farm supplies, garden tools, hardware and groceries. The cafe, a post office, a hairdresser/barber/massage spa, two taverns, a school, several small houses, and a tiny Buddhist temple made up the rest of Albion. Alan enjoyed his tuna sandwich (with bacon!) and a tall, juicy smoothie for lunch, which revived him enough to carry on to his goal of the day, Paddy. There he would find an inn, according to Adrian. Things went well until just after he crossed the Antrim River foot bridge. 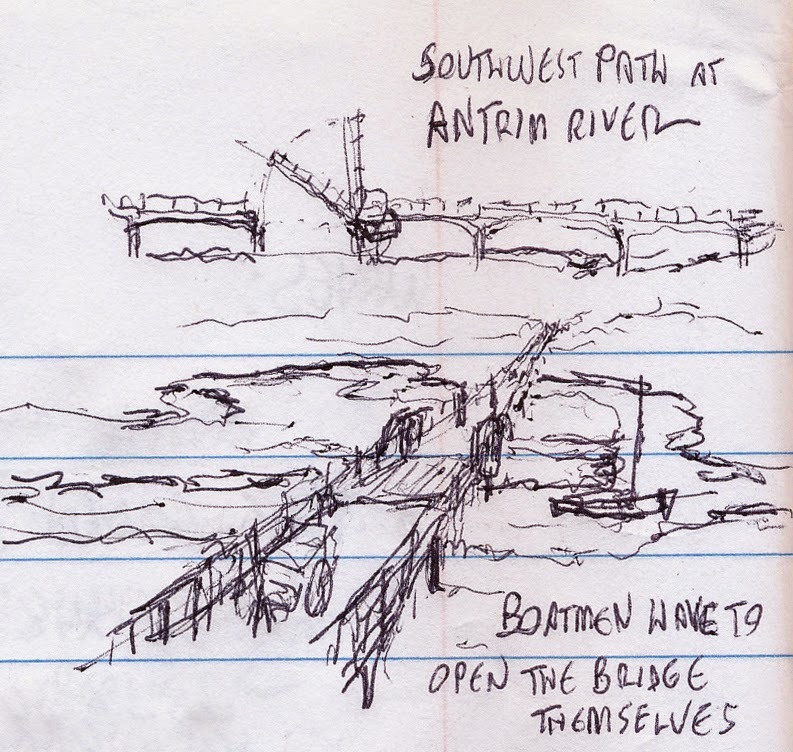 He was impressed by this long bridge built for a hiking trail, so he sat down to sketch it as well as get off his feet. Soon after he resumed his walk, he was distracted by the miles of marshes and estuaries around him, and he took a branch-path by mistake. It looked more or less like the main path, but almost an hour later he found that it ended on a lonely stretch of beach. This can't be right, he grumbled. I must have gotten on the wrong path. No wonder I haven't seen any markers or other people for a while...and I don't like the look of those big clouds out there. What happened to the sunny forecast? Then Alan noticed the house a short distance down the beach, and he sat down on a driftwood log and thought a minute. I suppose I could take my chances and see if whoever lives here might help me...it's way too late to try to get to Paddy now, but I hate knocking on strangers' doors, especially when I'm the stranger...drat!